Luthiery shares many aspects with fine woodworking, with several of the hackneyed platitudes ("measure twice cut once!") and process methods being shared. Most of my working time is spent transferring lovingly-calculated measurements from (in my instance, CAD) plans to the workpiece itself. This deserves the best concentration you can sum up and clear application to the job at hand. It's impossible to put that wood back once you've whizzed it up into chips and sent it up the extractor tube and then found out your marking out was at fault! Everything you can pour into the reliability of your plan-to-workpiece marking pays off through the finished product. Being distracted by a petulant pencil lead breaking or needing sharpening really doesn't help. I am of the opinion that a mechanical pencil is the most appropriate marking method for guitar work, or indeed any precision woodworking outside of joinery where perhaps a marking knife/gauge might be considered. Standard wooden pencils just don't cut it as the point varies in size through use and the continual time required to maintain a sharp point leaves you more of a pencil maintainer than a guitar builder. A couple of years ago I invested in some of INCRA's precision marking tools which are configured to be used with 0,5mm pencils. This led me into a long adventure of passively trying out a number of affordable mechanical pencils. I whimsically bought a bunch from Cult Pens (www.cultpens.com) including these Pilot Shakers, a couple of Uni Kuru Togas, a Pilot Supergrip, a Faber-Castell (I forget the model) and a few other cheapie pencils. Nothing really over the €10 mark (most were far less than that) since beyond this point you start seeing pencils designed for technical drawing and not marking up wood. These were all meant for use within the workshop, so immediately they'd be in a dusty environment and pocketed with other tools for hours at a time. No special care was taken to "protect" them. I do a lot of furniture work in addition to guitar-building, so by default they were being put into a punishing work environment. I ditched the leads that came with the pencils and loaded them all up with Pentel Ain Stein leads. Wood is rarely as consistent in its surface as paper (even after thickness sanding) and these have proven to be strong and resistant to hanging up and breaking as they pass over the grain and pores. Initially I disliked The Shaker. They're noticeably stouter (okay, "fat") compared to the other pencils, with the Kuru Toga (M5-450T) a close second. Within two months I'd experienced broken mechanisms, bent tips and a cracked body on almost all of the pencils. The Shaker admittedly saw less use than the others at first, but has outlasted them all by a clear margin and is still going strong. No issues in the slightest. The body is dinged, scratched and heavily weathered. The rubber grip is still in place and shows no signs of breaking up or stretching out. Fantastic. So what's different about this pencil? Well, there isn't that much to say about a pencil I guess. Certainly, the face that the tip is retractable is a big bonus. Being both "pocket safe" and resistant to tip damage helps. Compared to the slender pens and pencils that I prefer for writing and paper drawing work, I eventually warmed to the thicker grippier size of The Shaker. It is better in a workshop environment. Tired hands with poor grip strength can still confidently articulate around this pencil better after several hours of hard graft. The weight is welcome and confident. The primary selling point of this pencil is the "The Shaker" mechanism of course. Is it a gimmick or a genuine boon? Well, it has to be both. You don't need the shaker mechanism in the slightest. In fact, the pencil works identically to a "normal" mechanical pencil in spite of it. A heavy press on the rear button retracts or extends the writing tip whilst a light press advances the lead. No surprises there. The mechanism itself is a "double knock" where a quick shake upwards and downwards shifts a sprung internal weight to advance the lead mechanism. It works so nicely you can happily do two-three quick shakes at once to advance a larger amount of lead. Very nice. The original pencil is still working hard in the workshop. I bought another couple a few weeks back, and they feel identical to the one that has seen over a year of hammer. That of itself is impressive. The only real negative I could try and extract is that the shaker mechanism only seems to work on leads that are already engaged in the main mechanism rather than taking new ones up from the barrel. The last half-inch of lead that is normally supported by advancement of the subsequent one "shakes forward" but pushes backwards unless a new lead is manually advanced. A minor annoyance at best, and certainly not one that detracts from the simple usefulness of this pencil. If I was allowed to improve the design, I wouldn't change much if anything. Whilst one might thinks that a metal body would be better, the plastic one seems just as appropriate. The simple rubber grip is simplicity and works perfectly. Everything that I could imagine to be an improvement is more down to vanity cosmetics than a real practical upgrade. All in all, a pencil that performs excellently and seems durable enough to survive life with me. That of itself is not easy, and under ten sheets? This pencil has seen me through a small number of instruments and a lot of household furniture items. It has been lost, dropped, washed, left in piles of dust, thrown at people and shaken but never stirred. 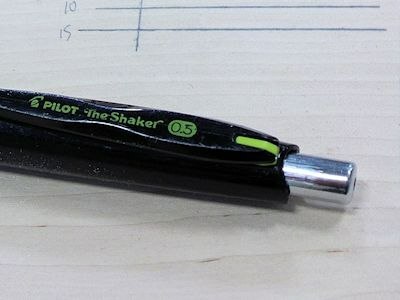 Pilot's "The Shaker" mechanism is available in a number of models, however this is the only one with a retractable tip. I recommend off the back of that alone. I wouldn't "upgrade" to the more expensive models since this simple aspect knocks it out of the park. Since I originally bought this pencil, other manufacturers have started to incorporate double-knock shaker mechanisms into their pencils....none of them have yet included the retractable tip! Pilot name this the "neXTage" in the US, so have a hunt around. Definitely worth a few Dollars/Euros/quid/francs/shekels to have for your marking up. The minor differences they add to your workflow and concentration are worth far more than these cost. update: These pencils have become my go-to since writing this article. I keep a few hanging around the toolbox at all times, and have a couple on my desk also. Great bang for the buck!